My grandmother was a teacher. She taught music. She taught art. She taught reading. She taught math, science and social studies. AND she taught me. I was in elementary school when she was invited to attend a professional development for art teachers using crayola crayons. She must have really enjoyed it because she spoke of that experience often throughout the rest of her life. At this class she went to the very first thing they told her to do was to unwrap her entire set of crayons and break them into pieces. She loved “preaching” to me about crayons because as it turns out, I was and still am a little picky about my crayons. I still prefer my crayons nice and wrapped, but let go of my need to fuss with keeping a neat box…. Imagine my horror when I started teaching. I inherited an old mildewed corrugated cardboard box full of crayons some of which were probably as old as I was. When my students needed crayons for an activity, they just came and got a handful. UHHGGHH! I hated that box! For the next few years I tried various configurations of crayon organizations. I used baskets (with holes larger than the crayons they held)…. 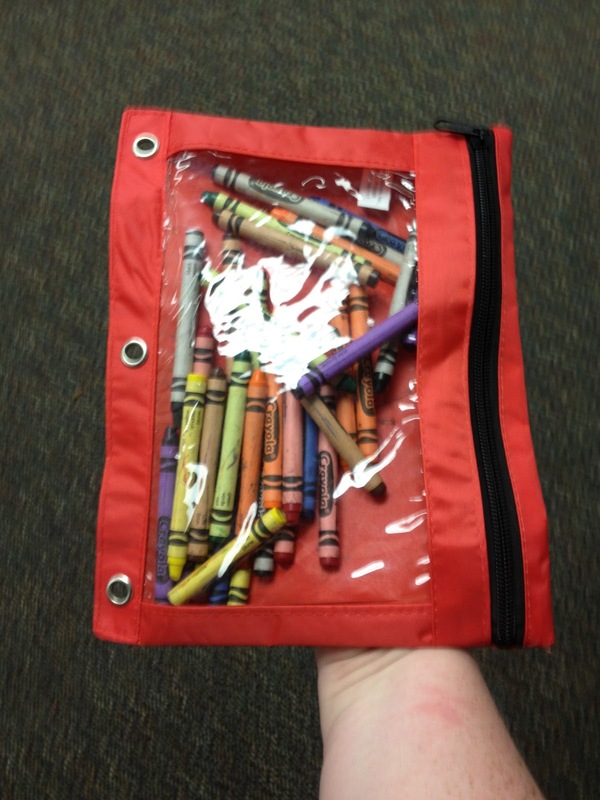 I used school boxes (with lids that would flop open and spill all of the crayons back on the floor) and then one day I found a 3-ring zipper bag like I had in middle school in my notebook and I haven’t used anything else since! Years later and I’m still happy with my bags. My favorite place to find them is at Dollar Tree stores I buy up all they have so that I can use these awesome bags to organize even more stuff! I wouldn’t recommend the ones with the plastic (heavy duty zip-lock) type sliders….. Those don’t work. Vinyl pouches with real metal zippers work the best. I find that when I need crayons out, it’s usually with my younger students who are impatient and ready to get started. If I don’t get those crayons out quickly then they will forget what I wanted them to do WITH the crayons……So I literally drop a bag and tell 5 kids to sit around the bag……I walk a few more spaces and drop another bag….. I can get all the crayons out and kids in groups in less than 3 minutes. THAT is GREAT when you are trying to keep your students on task. When it’s time to pack up, everyone picks up the crayons and zips the bag. I have a crayon bin and we are done! SOOOO EASY!